PURCHASE, NY – September 25, 2018 – In a world of rising nationalism, international travel takes on greater importance—breaking down barriers, broadening our horizons and driving economic impact felt throughout the world’s cities. For the past decade, Mastercard’s Global Destination Cities Index has offered important analysis of travel to and within cities. This year’s top cities are Bangkok, London and Paris, once again underscoring the importance of robust infrastructure, both business and leisure attractions and strong local culture. The Mastercard Index, which expanded this year to look at global 162 cities, is not simply a ranking of the top travel destinations. Based on visitor volume and spend for the 2017 calendar year, the in-depth analysis also provides a growth forecast for 2018 and—for the first time—a view into average length of stay and amount spent per day. 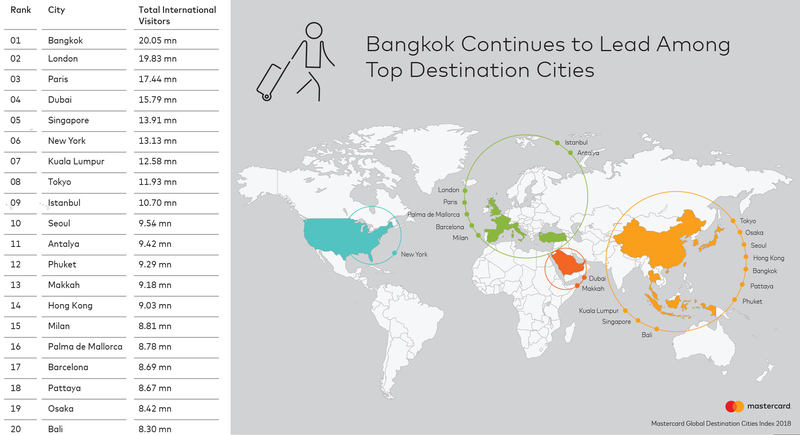 With roughly 20 million international overnight visitors, Bangkok remains in the top spot this year and is unlikely to be bested due to a strong projected growth of 9.6 percent for 2018. Interestingly, visitors tend to stay in Bangkok 4.7 nights and spend $173 per day, on average. However, not all cities are created equal when it comes to the amount visitors spend in the local economy. Dubai continues to be the top ranking destination city based on overnight visitor spend, with visitors spending a whopping $537 per day on average. It is joined in the Top 10 with newcomers Makkah, Saudi Arabia, which debuts in the number two spot, Palma de Mallorca, Spain, and Phuket, Thailand. Of the most visited cities, Istanbul comes in with the lowest spend per day at just $108 on average. 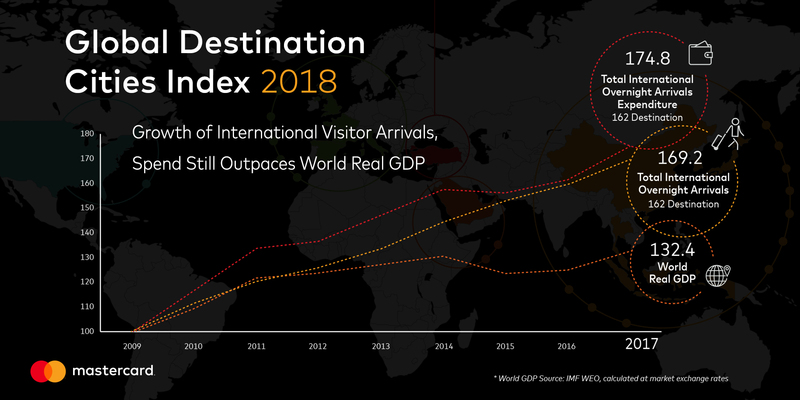 The Mastercard Index of Global Destination Cities ranks cities in terms of the number of their total international overnight visitor arrivals and the cross-border spending by these same visitors in the destination cities in 2017, and gives international overnight visitor growth forecasts for 2018. Public data is used in deriving the international overnight visitor arrivals and their cross-border spending in each of the 162 destination cities.